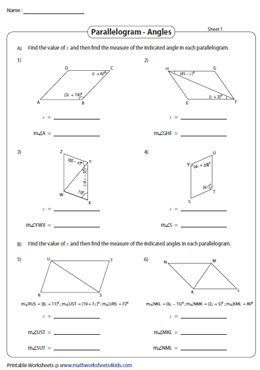 Introduce the concept "Angles in a Parallelogram" with this array of printable worksheets featuring key topics like find the indicated angle, solve for x when the vertex angles and interior angles are given and much more. 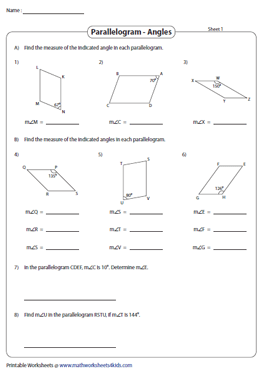 Teachers and home-school moms can facilitate quick revision on angles in a parallelogram with our easy-to-use worksheets. This set of PDFs is based on the properties of a parallelogram - opposite angles are congruent and adjacent angles are supplementary. Find the measure of the indicated angle in part A and determine all the missing angles in part B. 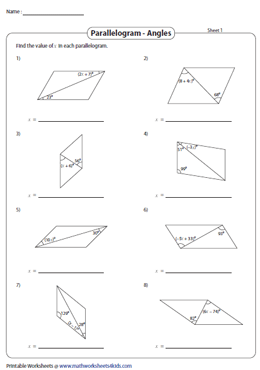 This assemblage of worksheets is based on the property - each diagonal divides the parallelogram into two congruent triangles. Apply the alternate interior angles and congruent property to find the indicated angle. 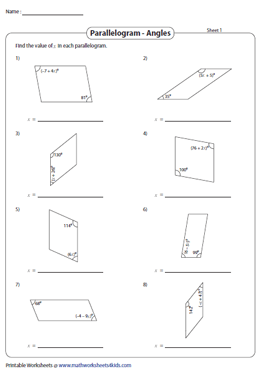 Explore the relationship between geometry and algebra with this batch of tailor-made worksheets for high-school students. The angles of a parallelogram are provided as algebraic expressions. Set up the equation and solve for x. 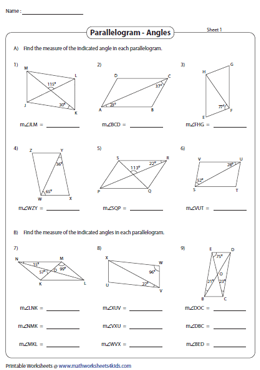 This bundle of worksheets features parallelograms with one or two diagonals. Angles are represented as whole numbers and algebraic expressions. Apply the angle properties of a parallelogram to find the value of x. The angles of each parallelogram are depicted either as whole numbers or as algebraic expressions. Equate the measures of angles and find x. Substitute the value of x and find the indicated angle.